LIL PICARD known also as the "MUSE OF THE AMERICAN AVANT-GARDE" and the "GRANDMOTHER OF THE HIPPIES," Picard, a native of Germany, traveled in the Berlin dada circles before escaping the national socialist government with her husband and immigrating to the United States in 1936. In the late 1950s and '60s, she was a member of the NO!art collective, as well as a friend and collaborator to many artists associated with North American Pop Art. 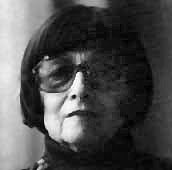 An artist and a journalist, Ms. Picard wrote for avant-garde and political weeklies in Germany until she immigrated to the United States in 1937. She has had numerous one-woman and group shows here and in Europe  her first one-woman show in the United States being in 1958. Since 1964, she has created many Happenings. Currently, Ms. Picard is a regular contributing critic on the American scene for a number of German newspapers and periodicals, including Kunstforum International and is a contributing editor for Andy Warhol's Interview. From 1955 through 1981 Picard had 15 solo exhibitions of paintings, sculptures, watercolors and drawings, collages and assemblages in the United States and West Germany. In addition, her work was included in more than 40 group shows, most notably the two-part landmark exhibition "New Forms -- New Media" at the Martha Jackson Gallery in New York and "12 Evenings of Manipulations" at the Judson Gallery (1960). She later became an activist affiliated with the art-based anti-Vietnam War movement in New York.—Died 1994 in New York.